Free Money After College Guide is Here! 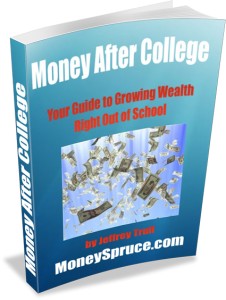 My free new ebook, Money After College: Your Guide to Growing Wealth Right Out of School, has arrived! I’m stoked to finally be able to get this out to any college graduates that will be receiving their diplomas in the next few weeks (I’ll be walking at Tufts Commencement as well). Of course, even if you’re not a college grad, you can still learn a lot from this guide. I wrote this guide simply because it’s something I wish I had when I graduated college. If you feel the same way as I did, you may be a little overwhelmed by all the “adult things” that you didn’t learn but are expected to know as you’re forced to “grow up.” While becoming an expert on everything-adult isn’t necessary right after graduation, there are many important money matters that you need to learn, right away. I’ve included some of the best info from Money Spruce, and I’ve done my best to link to other books and references that will be helpful to learn more on each of the topics. Be sure to click here to get access to the guide right away! Hey Jeffrey, thanks for writing this! Right after college is probably the most important financial time in a person’s life… paying off that debt, saving up some money, and beginning to invest are awesome things to do that only get better the earlier you start! Excellent work. thanks for the writing a great book on the subject of money. I think money is very hard to make and we should not waste it. My First Freelance Post on Adaptu!